Kazimierz was once a town competing with Cracow and today it is a part of it. After the war damages it slowly comes back to its splendour. The restored walls, synagogues, graveyards, townhall, market and other places of Jewish community cult and the numerous international cultural events attract people from all over the world. We invite you for a stroll across the unusual Kazimierz with the unique perspective map drawn with a pen in ink and watercolours by an artist cartographer. For many weeks, Stepan Abrahamyan used to cross the streets and backstreets of Cracow's Kazimierz, providing precise documentation for all details of the city's architecture, to illustrate as truly as possible, its contemporary image. This panoramic map is the first perspective image of Kazimierz in 170 years. It shows the variety of architecture testifying the turbulent history of the town. In the landscape of Kazimierz famous churches and monasteries emerge next to the synagogues and previous prayer places . Here, like threads of history, get crossed the streets of Esther's with Miodowa, Warszauer's, Meisel's and Josephp's with the street of Boże Ciało. 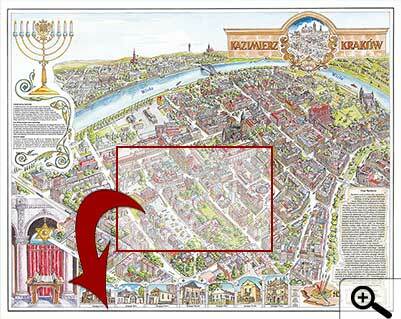 This panoramic map features majority of the old Jewish town buildings, f.eg. the old Mykwa (the Jewish ritual bath) ,Hebrew gymnasium, Jewish hospital, ritual slaughterhouse of poultry, Society of Studies of Tora or the school for girls Bejs Jakow. Panoramic map is decorated by pictures of seven beautiful, presently open synagogues. To compare you can see the old panorama from the 18.th century at the title table. Menorah and Aron hakodesz create the picturesque ornamentation of the map. We encourage you to discover the beauty of monuments and other objects of old Kazimierz with the help of this unique panorama of the town, which in a close up will show the richness of details and the perfection and mastery of the artist.